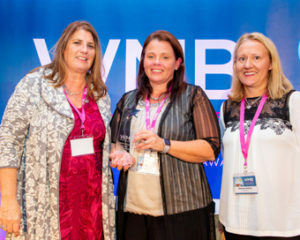 The WMB Awards are so much more than ‘being on the shortlist or raising the trophy’. They are about putting yourself out there so that others can be inspired, can be encouraged, can believe that it is possible to be a woman in business today and to achieve your goals whatever they might be. 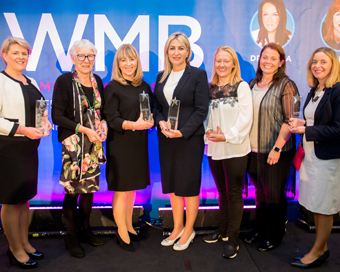 Nominations across WMB’s six Award Categories for 2018 covered a diverse range of industries – manufacturing; pharma; medical; marketing; education; financial; technology; social; recruitment; childcare, homecare to name just a few. An interesting observation from submissions was the part ‘fear’ plays in a journey toward success. Fear can, and does stretch us to perform better, and rewards us when we come out in one piece at the other end of it. One nominee encourages us to embrace it – to ‘Feel the fear, and do it anyway’; whereas another is pragmatic in her approach: Potential = Talent – Fear + Discipline! The WMB Awards on Monday (October 8th) was a day of celebration, of contemplation and a day that introduced new connections and reignited old ones. It could not have taken place without the support of WMB’s sponsors and the participation of attendees and finalists. 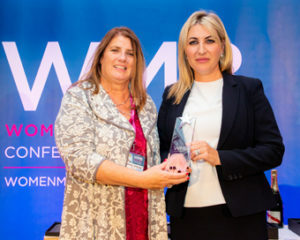 There were six Award Categories – Matheson WMB Female Entrepreneur Award; Newstalk WMB Female Social Entrepreneur Award; WMB Woman in Technology Award; Sodexo WMB Female Newcomer Award; Boots WMB Empowering Women Award and the WMB Businesswoman Award. As Vice-President and General Manager for Ireland, Aisling is responsible for driving Dell EMC’s commercial and enterprise business on the island of Ireland. 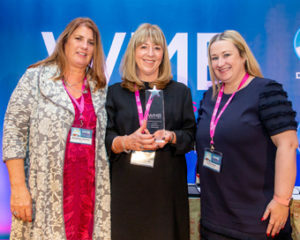 In addition to managing the continued growth and expansion of the business, Aisling also provides strategic leadership and direction for over 5,000 team members working in global and regional teams based at Dell EMC sites across Ireland in Cork, Limerick and Dublin – ranging from manufacturing, to solutions, EMEA IoT lab and Dell Bank. In addition, Aisling was the Chief Integration Officer for Dell EMC UK1 from the legacy Dell side as the two companies came together. Aisling has built up a well-respected profile within the tech sector during her years at Dell EMC. This year, Aisling was named amongst the top 20 female leaders in the technology, media and telecoms sector (TMT). Scientist Andrea Doolan is Co-Founder and Chief Executive Officer of Atlantia Food Clinical Trials Ltd., a world-class clinical studies research company providing full service study expertise to the global food, beverage and health supplements sector. In 2013, Atlantia spun out of APC Microbiome Ireland at University College Cork. (APC’s mission is to link Irish science with industry and society through excellence in research, education and outreach in gastrointestinal health). Since then the company’s client base has grown to include some of the largest food companies in the world across the USA, Europe, China, Japan and New Zealand. Clients come to Atlantia to conduct research on a particular health claim that they wish to assert on a new or existing product. Atlantia employs 25 highly experienced personnel and there are plans for expansion both at its base in Cork and in the US. (Pictured (l-r): Rosemary Delaney, WMB with Andrea Doolan, Atlantia Food Clinical Trials and Tara Doyle, Matheson). Liz is CEO of An Cosán a large community development centre in Tallaght West to include a social enterprise initiative VCC (Virtual Community College) which has scaled the work of Tallaght West nationally with a presence now in 22 counties. An Cosán is a recognised expert in the delivery of lifelong learning, from early years to adulthood in communities that struggle with the injustice of poverty. Students who struggle with poverty, young and old, experience a variety of complex educational and social challenges which require a unique, dedicated and focused response. As a result, a distinctive and very successful holistic model of community education has developed through An Cosán VCC with specialised learner-centred supports which facilitate each person to achieve their lifelong learning goals and access rewarding employment, thus addressing some of the extensive barriers experienced by disadvantaged communities. 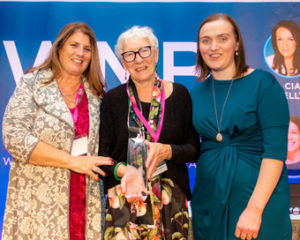 (Pictured (l-r): Rosemary Delaney, WMB with Liz Waters, An Cosán VCC and Patricia Monahan, Newstalk). Award winning TestReach Co-Founders Louella Morton and Sheena Bailey are on a mission to completely disrupt the assessment and examinations world, as it is ripe for change. TestReach is a provider of software to run assessments and exams online. What makes TestReach unique in the marketplace, is that for any exam you can “turn on ” remote invigilation. This means that for that exam, their trained supervisors will monitor candidates in real time over the web during their test using video, audio and remote screen share, plus everything is recorded and can be reviewed at a later time if required. It is very secure and completely preserves the integrity of the exam. Literally within a day or two exams can be run in all four corners of the globe for any customer, and this completely eliminates the need to source and manage test centres, the overheads of securely managing the flow of exam papers and answer sheets, plus it removes a large amount of administration and therefore costs. (Pictured: Rosemary Delaney, WMB with Louella Morton & Sheena Bailey, TestReach). Christine is Digital Sales Director for the UK Market within Microsoft and is responsible for engaging customers with the right touch at the right time on their digital journey. She has 30+ years’ international sales and marketing experience coupled with operational, customer engagement and people leadership. On empowering women, Christine has been involved in setting up and leading mentoring circles, increasing visibility and role modelling of senior females, roundtable sessions with leaders, coaching facilities for females and sponsorship of talented females for future leadership roles. Microsoft is very active in the Connecting Women in technology forum, which Christine helped to co-found with Dell, Accenture and EY in 2009. Coaching and mentoring school girls, graduates and early in career females holds a dedicated place in her weekly schedule. 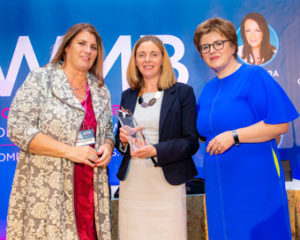 (Pictured (l-r): Rosemary Delaney, WMB with Christine Barrett, Microsoft and Martha Ryan, Boots Ireland). Fiona Edwards Murphy, Founder & CEO, ApisProtect. Fiona founded ApisProtect in 2017 which aims to create a technology solution to improve the yield of commercial beekeeping. The ApisMonitor is the company’s first technology solution. Beekeepers manage 91 million beehives worldwide, helping to pollinate one third of the food we eat every day, and they are in trouble due to a variety of hive health problems. Specifically, the company uses in-hive sensors to unobtrusively monitor honey bee colonies, and then provide the beekeeper with in-depth information about the health and condition of their colonies, using machine learning and big data technologies. The technology has been rolled out to 200 beehives internationally. This will give Fiona and her team, the bee database and market insights required to begin product sales next year. Dr Edwards Murphy’s work has received many national and international awards from the Irish Research Council, The IEEE, IBM, The Irish Laboratory Awards, Google and the Global Entrepreneurship Summit. 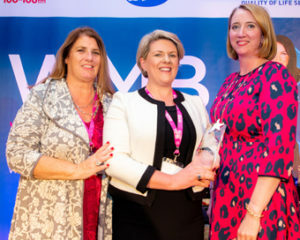 (Pictured (l-r): Rosemary Delaney, WMB with Aoife O’Mahony on behalf of Fiona Edwards Murphy, ApisProtect and Margot Slattery, Sodexo Ireland).